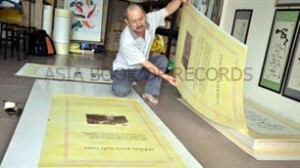 A wooden book, measuring 120kg in weight, 125cm in length, 80cm in height and 16cm in width, was made by Prof. Dr. Hoang Quang Thuan of Vietnam. The enormous book, which was made by using mahogany wood, has 300 pages with 143 Vietnamese poems (written in calligraphy with illustrations), and is named as “Poetic Clouds of Yen Tu”. He wrote the book from 2008 to 2011. Comments for BIGGEST WOODEN BOOK are now closed.